Rocktober is almost over but November will take it up to 11 with the release of the first BrÃ¼tal Legend DLC pack, Tears of the Hextadon. Tears of the Hextadon will feature two new multiplayer maps: The first, Circle of Tears, features a circular battlefield carved by "vile waters" that players must battle through in order to destroy their opponents, while the second, Death's Fjord, puts players on an icy mountain pass overlooking a dense pack of fans ready to be harvested - but only by those willing to break cover and expose themselves to their enemies to do it. The map pack also includes a new axe, the ominously named Blade of OrmagÃ¶den. 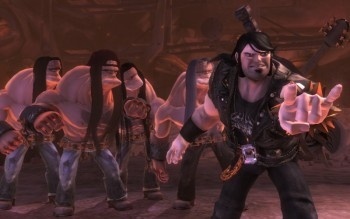 "I play BrÃ¼tal Legend online every night," said Tim Schafer, the big cheese at Double Fine Productions. "And I need more maps! Circle of Tears is named after the crying of my vanquished foes on the battlefield, and Death's Fjord is obviously a tribute to my Nordic ancestors, and their love of fan geysers and... Well, actually I just thought the name was cool." I have no idea what a Hextadon is but it sounds f'n metal and that's what really matters. Tears of the Hextadon comes out on Xbox Live on November 3 for 400 Microsoft Points and then lands on the PlayStation Network on November 5, where it will be available as a free download until November 19, after which it will cost $4.99.